Former Rep. Lynn Gattis filed a letter of intent to run for lieutenant governor on Aug. 3. Gattis grew up homesteading in the Gulkana area and attended the University of Alaska, where she earned her bachelor’s degree in aviation technology. She has worked for several aviation companies around the state and is a pilot. Until recently, she grew hay on her farm outside of Wasilla and has run her own businesses. Gattis, a Republican, moved to the Mat-Su Valley over 25 years ago. Before being elected to the Alaska House of Representatives in 2012, she was elected to the Mat-Su School Board, served on the Goose Creek Citizens Advisory Board, worked on the Pt. Mackenzie Comprehensive Plan, and was named to the Alaska Transportation Council. She has also been active in the Boy Scouts, supporting scouting endeavors for many years. While in the Legislature, she served as Chair of the House Education Committee, Co-Chair of the Mat-Su Valley Delegation, and as a member of the Transportation, Fisheries, State Affairs, and Economic Development & Tourism Committees. She also served as Co-Chair of the Statewide Sustainable Education Task Force and was appointed as a member of the Education Commission of the States. Gattis says she’s been talking with people from around the state and forming her thoughts on what kind of lieutenant governor can best serve Alaska. Gattis, who lost to David Wilson in 2016 when they both ran for the Senate seat that Sen. Charlie Huggins vacated, has identified a campaign manager and has her core team working on the foundations of a statewide campaign. Earlier this week, Republican Sen. Gary Stevens of Kodiak was the first to file for lieutenant governor. The primary is Aug. 21, 2018. Is she running as a Republican or a Demorat? Just curious; I vote in MI. I lived in AK 1978-1981… Loved it very much; I was also a Scoutmaster in Muldoon (Troop 232), and my wife was a Girl Scout Leader at Ft. Richardson. The lieutenant governor is the protector of the state seal, so don;t lose it, that is the best served Lt. we can have. Unless your going to be like Governor Mallott? 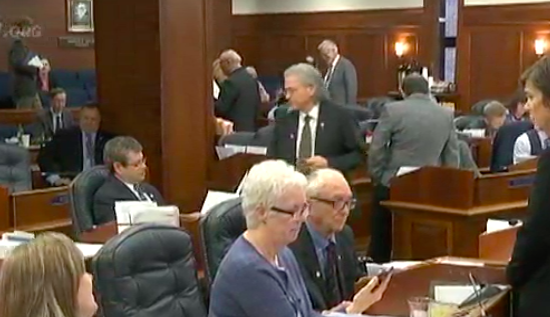 Lynn Gattis is the one that wants all the seniors citizens to move out of Alaska if they can’t afford to live here. They are the people who worked hard to make Alaska great.